Now that December has officially come, even the Grinches of the world have finally begun putting up their Christmas trees and enjoying the tradition of decorating them. For parents of very young toddlers, however, this tradition may be underscored by a fair dose of fear and tension as the magnetism between chubby little hands and bright, sparkly lights and ornaments is observed. In other words, how do you keep your curious toddler from felling the Christmas tree? Brie Gowen, a contributor to FaithIt, shared the suggestion given to her years ago by a woman at church which she says seemed so insanely simple, she doubted it could possibly work. "Yet here I am," she writes, "I’ve used this tried and true trick for about seven years now, and it’s worked every single time." Gowen is certainly no Grinch, as she describes the thoughtful "heirloom style" of tree decoration she loves, and the deep emotional significance many of her ornaments hold: "I had ornaments my mother had gotten as a young woman in Germany. I had the first glass balls I had ever owned, ones my mom had plucked from her own tree to help me fill my branches. I even had the Snoopy ornament from my first Christmas as a baby." "I had gotten most of these from boxes, after my mother’s recent death, and clinging to these memories helped me," Gowen explains, "So thoughts of my child toppling over my tree filled me with dread, and I expressed such to the ladies at church one day after the service so many years ago." 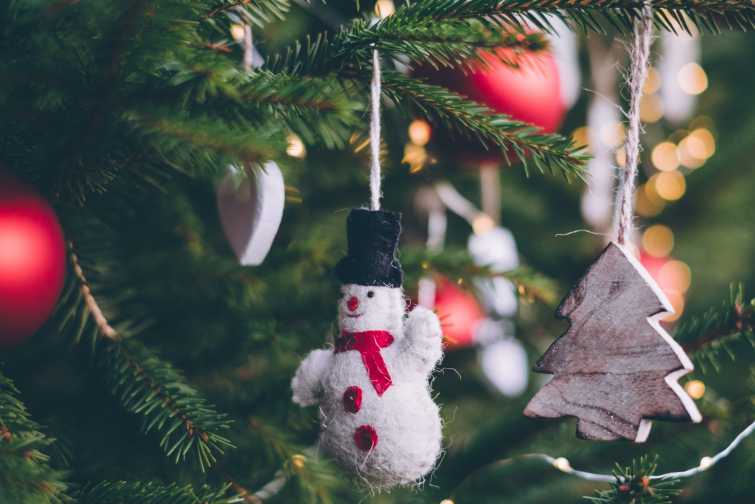 The incredible tip one woman shared with Gowen flipped a switch, in her mind, going from "elaborate fences and barricades" to keep children away from the tree to a safe, creative way to allow even the most precocious children to enjoy the tree. Even when going through the trials of "terrible twos" and "threenagers", Gowen reports that her family "had suffered zero tree incidents and absolutely no, I repeat no broken ornaments." So what’s the secret? Just two little words: "One Finger". The older and more experienced mom at Gowen's church explained that the key isn't in finding ways to hide the tree from your child or protect it from them, but to give a clear and reasonable boundary for precious little hands that learn and experience their world through touch. In a nutshell, you show your children how to touch the tree, the lights, the ornaments with just one finger, and use "one finger" as a gentle command to remind them. When a little boy or girl first sees the amazing sight of a lit and decorated Christmas tree, it's incredibly natural for them to want to touch it, like a moth to a flame! It's when we don't allow them to experience this touch, with reasonable boundaries, you'll see more "tree mishaps and ornament disasters," Gowen says. "But by allowing them to experience the tree with their fingers while still placing limits, you end up with a delighted child and happy Mommy." You, like Gowen did at first, might think this trick is too silly and simple to work, but try it! "If you give them the strong and authoritative instruction of 'One Finger' when they first encounter the Christmas tree they’ll follow it," Gowen assures readers. "You most likely will have to remind them with this two-worded command the first few encounters, but it will stick." For the youngest toddlers who are experiencing their first Christmas out of Mom or Dad's arms, this trick is incredibly effective. It's also a lesson that will serve them for the rest of their toddlerhood Christmases, making the tree less off-limits and enticing. Allowing them to touch the tree, even with just one finger, and experience it for themselves is enough to satiate their God-given curiosity. Try it!